When I ask whether they edit their blog posts, people say things like, “I was so relieved to have finished the post, I just wanted to check it off my list and get it out there.” Can you relate? By skipping the editing phase of the blog writing process, you may unintentionally turn off the people who land on your site. Instead of building credibility, you lose it; instead of loyalty, you create hesitation to click on more of your links in the future. There’s a saying that how you do anything is how you do everything. If people see you haven’t taken care to proofread your blog posts, they may wonder how you take care of other details in your business. Grammar and spelling problems distract the reader, creating a barrier and blocking your message from getting across. The blog post fails to fulfill its purpose to educate, inspire and help your readers, and you fail to make a connection with someone who could have become a client or fan. Step away. Build time into the blogging process so you can edit a few hours (or days) after you finish writing. This distance will help you spot errors. Listen to your post. Read the post out loud, or use a text-to-speech feature via Mac or Windows. When reading, your mind tricks your eyes into seeing what you meant to type, rather than what you actually typed. What the eye misses, the ear can catch. Look it up. Bookmark some go-to sources for grammar and spelling questions, such as Grammar Girl and Merriam-Webster. De-capitalize. Resist the urge to capitalize words because you think they’re important. Here is an excellent article that explains the difference between legitimate capitalization and vanity capitalization. Even before they read a word of your blog post, people can be scared away by big blocks of text. Long paragraphs make it more difficult to keep their place on the page, let alone grasp the concepts they’re reading. Eye strain, confusion, hard work – these are not the feelings that will draw in readers and keep them returning to your blog. People aren’t just searching for information they can trust, they want a pleasant reading experience. Paint a picture. Use images to break up the text and create visual interest and an emotional connection. Use the return key. Cap each paragraph at three or four lines at the most. List your points. Incorporate bulleted or numbered lists. Head up your sections. Use sub-headings for each main topic in your article. When people click on a link to visit your blog, it’s because they hope the post will answer a question they’ve had, validate something they already believe, teach them about something new, or just be a pleasant diversion. If your post fails to deliver on its promise, or simply wasn’t what the person expected, they may hesitate to click on your other links in the future. Stay true to your title. If the post is turning into something other than you planned, either change the title to the new focus, or scrap the post and start again. Be strategic and reader-focused. Know the main themes and topics that are most important to your audience, and stick with only those. Plan ahead with an editorial calendar. When you’ve already decided what you’re going to post, you’re more likely to stay focused on that topic. Be relentless. Constantly ask yourself, “What is my point?” If anything you’ve written doesn’t support that point, save it for another article. There is a wealth of information out there today, and chances are you’re not the only one writing about your topic of expertise. If your blog posts are too generic, you don’t give people a reason to keep reading or come back. They’ll also have a harder time remembering and using your ideas. Stick to your categories. Your categories are an intersection of your unique combination of skills, interests and experiences. They represent the specific questions your ideal clients want answered, and the topics you want to be known for. Be bold. Express your opinions, even if they’re different from prevailing wisdom or what other people have said or written. Be yourself. On your blog, give people a taste of what it’s like to do business with your company. Whether your blog has multiple voices, one main voice, or a company voice, use it to bring your personality to life. When someone arrives at your blog, it may be their very first visit, or their fiftieth. They may be an absolute novice at your topic, or an expert. While you can’t be everything to everybody, there are ways to meet your readers where they’re at to make a stronger connection and improve their experience at your site. Eliminate jargon. Make each post friendly to someone who is brand new to your blog and your topic. Put yourself in their shoes and scan for any terms that need to be replaced or explained. Provide links with more information, whether internal links to your own site or external links to other resources. Beginners can dig in to get background information they may be missing, and experienced readers can go deeper on particular topics. Write for one reader at a time. As you read your post aloud (see #1), imagine your ideal reader is sitting across from you. Blog editing is about much more than apostrophes or typos. 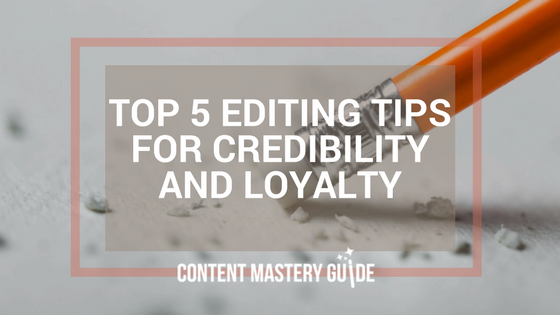 By keeping a watchful eye on all five of these editing elements, you will earn readers’ trust and respect, and keep them coming back. Over time, that trust will convert to the right people saying yes when your offer fits their needs. Editing is just one part of my 7-step blog writing process. You can learn the whole system by attending my next free webinar, Write Less, Earn More. Register now to save your spot! Note: An earlier version of this post appeared on the SteamFeed blog, which is now closed.